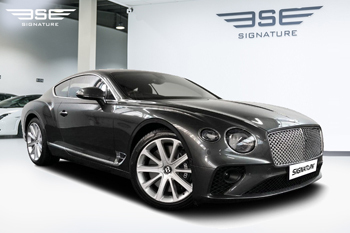 Everyone at Signature Car Hire London is delighted by the arrival of the stunning new Bentley Continental GT hire car. Proudly glistening in the sun at our new Heathrow branch, this coupe is everything you would expect from Bentley. Luxurious, refined, sporty and desirable! And now available to rent from Signature. This automatic W12 coupe comes with 4 seats, which are black/red leather contrasting beautifully against the glossy grey exterior. This rental supercar from Bentley comes with a powerful twin-turbo 6 litre engine that can achieve 0-60mph in just 3.6 seconds and will keep accelerating to 207mph. This is a driver’s car. For a rental coupe sports car there is still plenty of space up front, and the electric seats adjust in every direction making it easy to find the most ideal driving position. This model is slightly bigger in all dimensions but most notably between the axles, where more than 100mm has been added to the wheelbase. Get more details and see more pictures of this rental Bentley here. 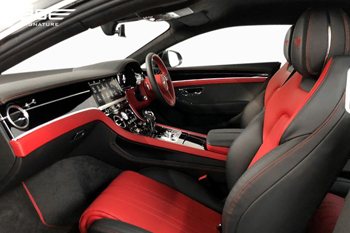 To rent this Bentley Continental GT in the UK simply call one of our helpful customer care advisors on 0207 118 2244 today or get a quote on-line.